Can Bryce Harper lift the Nationals back into the playoffs after a miserably disappointing 2015? The NL MVP will have his work cut out for him. This week, SI.com is previewing all 30 MLB teams for the 2016 season, counting down to the No. 1 team in the league. At No. 13: the Washington Nationals. So long as Bryce Harper wears a Nationals uniform, Washington will contend. That was proven last year, when a dysfunctional and inconsistent team stayed in the race for the National League East title almost solely thanks to Harper’s superhuman season. The 22-year-old outfielder put together the kind of historic year we’ve been waiting for since his 2012 debut: .330/.460/.649 in 654 plate appearances, with his on-base and slugging percentages leading the majors; an NL-high 42 home runs; 124 walks; a major league-best 195 OPS+; 9.9 Wins Above Replacement; and a unanimous first-place finish in the NL MVP voting. Mike Trout may still be the best player in the game, but Harper’s ascendance into superstardom has made it a true debate. For as good as Harper is, the team around him isn’t bad, either. The Nationals have a top-five starter in Max Scherzer and a former No. 1 pick in Stephen Strasburg to anchor one of the best rotations in baseball. Anthony Rendon returns healthy after losing most of 2015 to oblique and knee injuries; if he can get back to his near-MVP form from ‘14 (125 OPS+, 6.6 WAR), he and Harper will give the lineup a tremendous 1-2 punch. That lineup has started to sag a bit thanks to injuries and age, but it still boasts plenty of power between Harper, Rendon, Wilson Ramos, Danny Espinosa and new addition Daniel Murphy. Fellow free-agent signee Ben Revere, meanwhile, will act as the table setter, something that last year’s team routinely lacked due to Denard Span’s inability to stay healthy. That’s not the youngest group of players (Harper and Rendon aside), but the Nationals’ deep and productive farm system (ranked fifth by Baseball America this winter) should help fill in where needed. 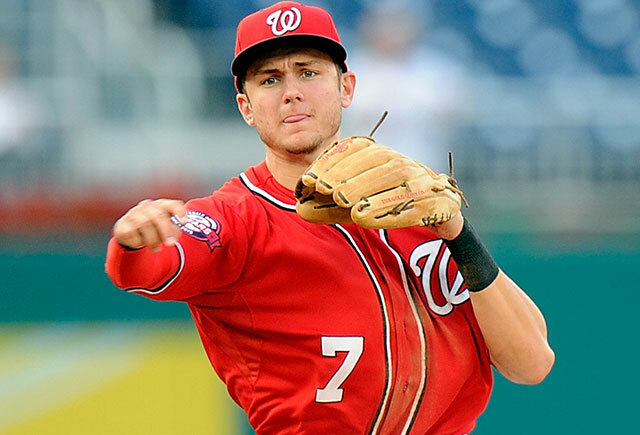 In particular, shortstop Trea Turner and righthander Lucas Giolito will be big pieces for this year’s Washington team. Turner, the organization’s top positional prospect, got a cup of coffee last season and, after a stint in Triple A, should be up by the second half as the everyday starter who will provide speed, defense and solid hitting. The upside for Giolito is even higher: Arguably the best pitching prospect in the game, Giolito mixes an outstanding fastball and curveball and projects as a No. 1 starter—not a bad piece of depth for the Nats. For as brilliant as Harper and Scherzer were last year, they couldn’t do it alone. Picked by many to run away with the NL East, win the pennant and finally capture the first World Series title in franchise history, Washington instead sputtered and flailed its way to a barely-above-.500 record and an embarrassing second-half collapse. Arguably the biggest story during the Nationals’ season wasn’t Harper’s dominance on the field, but his being assaulted in the dugout by closer Jonathan Papelbon, who put his hand around the throat of the team’s superstar during a dugout skirmish in late September. Though his $13 million salary for 2016 made him tough to trade, it’s inexcusable that Papelbon remains with Washington. Manager Matt Williams, however, is gone, having been replaced by 66-year-old Dusty Baker, a veteran skipper who should help fix what was a fractured, miserable clubhouse. But even if Baker can get his players to put their bad feelings aside (and avoid overtaxing his starting pitchers, which has been a problem for him), he still has to contend with an aging lineup that will likely be Washington’s downfall. Jayson Werth (36) and Ryan Zimmerman (31) broke down last season, with Werth managing just 88 games, an 84 OPS+ and -1.6 WAR, and Zimmerman limited to 95 games, a 105 OPS+ and 0.7 WAR. Despite their advancing years and increasing fragility, the Nationals opted to stick with their veterans; aside from Murphy and Revere, the team made no other notable additions to the roster, hoping instead that last year’s group would bounce back and play up to its potential. Giolito’s path to the big leagues is complicated by a full rotation (though injuries or a failure by either Tanner Roark or Joe Ross to handle a full-season workload could open the door). Turner, too, has a major leaguer standing in his way in the form of Espinosa, but taking his spot shouldn’t be too difficult. Espinosa’s defense at shortstop is merely average, and his bat hasn’t been much better, as he has just an 87 OPS+ across six seasons. The mustachioed 28-year-old does have pop (13 home runs last year), but he lacks plate discipline and struggles to make contact. All of Espinosa’s failings make it more than likely that, should Turner handle Triple A pitching this spring, the Nationals will turn to him to be their second-half starter at shortstop. That’s not a given, but Turner fared well in his first taste of the International League last season, slashing .314/.353/.431 in 205 plate appearances at just 22 years of age. If he can replicate or better those efforts, he’ll move up to Washington, where he’ll get a chance to put his game-changing speed (70 on the 20–80 scout grading scale), strong bat and solid defense on display. For a team that just lost its starting shortstop of the past six seasons in Ian Desmond, Turner could provide an immediate boost this year and cement himself as the shortstop of the future. That was Daniel Murphy’s slugging percentage from Aug. 1 through the end of the season with the Mets—a figure that doesn’t include his historic power barrage in the postseason, when he bashed seven home runs in 14 games. It was an unexpected outburst from Murphy, a longtime fixture in New York who had been known more for his inconsistent defense and line-drive style of hitting before he transformed into the second coming of Babe Ruth. But something clearly changed for Murphy in the second half last season, and the Nationals bet the next three years and $37.5 million this winter on it being permanent. That Murphy, who turns 31 on April 1, will blossom into a 30-homer power threat at his age is about as likely as him winning a Gold Glove at second base. But the Nationals don’t need him to do that. They just need him to maintain the approach that was so essential to his increased production. A closer look at the numbers suggests that Murphy was simply putting better swings on balls: His slugging percentage on four-seam fastballs jumped from .424 before Aug. 1 to .586 afterward. He did the same on sinkers (.500 to .660), sliders (.425 to .821) and especially curveballs (.206 to .586). The result? More fly balls in the second half (39.4% of balls put in play compared to 32.3 before the All-Star break) and more home runs (9.5% to 6.8). Is that kind of increase repeatable? It is if Murphy sticks to the swing change implemented by Mets hitting coach Kevin Long before the 2015 season, one that Murphy credits for his October heroics. With Washington’s lineup desperately needing another power bat, Murphy could be crucial to getting the Nationals back to the postseason—and perhaps derail his old team’s chances along the way. "He has not reached where he should be, and he's going into his free agency year. He's still a third starter [despite] that stuff.​"
"Maybe it's because he had the big year two years ago and then last year he was hurt, but I don't think the world knows how good of a hitter he has got a chance to be.​"